In the last few years ASRock has been producing great high-performance, bargain priced motherboards. Today we are reviewing the 890 FX Deluxe 4 motherboard. This board claims to be a "World's First" as it supports front USB 3.0. This board is designed for AMD AM3 processors only - which includes the AMD Phenom II X6 6-Core CPUs. It also boasts true 333: USB 3.0, eSATA 3.0 and SATA 3.0 (6GB/s). The ASRock 890FX Deluxe 4 comes in a large flashy box that has recently graced the high-end ASRock motherboard series. 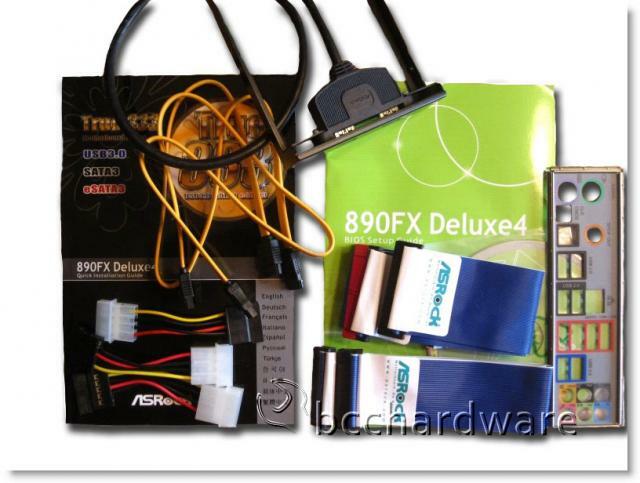 Included in the box is the standard Rear I/O shield, manual, driver CD and Molex to SATA adapters. Also in the box are three SATA cables, an IDE cable and a floppy cable as well as their front USB 3.0 Panel. The board supports ATI CrosfireX, 3-Way CrossfireX and Quad CrossfireX. The 890FX Deluxe 4 comes with four DDR3 slots that have a max capacity of 16GB. This board has three PCIe 2.0 16x slots, two PCIe 2.0 1x slots, two PCI slots, six SATA 3.0 GB/S connectors. The SATA system is based on the AMD SB850 chipset which supports RAID (RAID 0, 1, 0+1 and 5). There are also two SATA3 6.0GB connectors thanks to the Marvell SE9123/9120.